Saudi Arabia has approved a US Peace Plan, which is reportedly detrimental to Palestinians and favorable to Israel, Now York Times report. 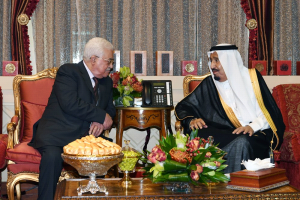 The Times bases its report on accounts by Palestinian President Mahmoud Abbas, several Palestinians, regional and western figures following Abbas’s last month unplanned visit to Riyadh. The Palestinian leader travelled urgently last month to Riyadh to meet with the 32-year old Crown Prince. The gist of the meeting was not made public but Palestinian, Arab and Western officials note that Abbas was presented the US Peace Plan, which could grant Palestinians a state in the limits of the West Bank as opposed to 1967 borders. The Palestinian would also have limited sovereignty over the territory. Israeli illegal settlements in West Bank will remain in place. The plan excludes East Jerusalem as the future capital of the Palestinian state and there would be no right of return for Palestinian refugees and their descendants, New York Times notes. Abbas who has not made public the proposal is said to have received pressure from the Crown Prince to accept the plan or be replaced by another Palestinian official who is more favorable. Washington has denied the existence of the plan, saying the US is still working on its own peace initiative plan. Palestinian officials from Hamas and its rival Fatah, and other Arab officials have expressed astonishment over the proposal, which opposes the Arab League stance on the Palestinian cause. “If the Palestinian leadership were to accept any of the above, the Palestinian people would not let them remain,” said Hassan Yousef, a senior Hamas leader in the West Bank who is also a member of the Palestinian legislature. Many questions have emerged as to the role of the Saudi Crown Prince in the decades-long conflict. The Times’s report also came as speculations whether President Trump will declare Jerusalem as Israel’s capital are mounting. The Crown Prince has been rumored to be cozying up to Israel recently as the kingdom seems moving to build an alliance with Israel against Iran. Written by: KanelkaTagba on December 4, 2017. Posted by KanelkaTagba on Dec 4 2017. Filed under Headlines, World News. You can follow any responses to this entry through the RSS 2.0. Both comments and pings are currently closed.